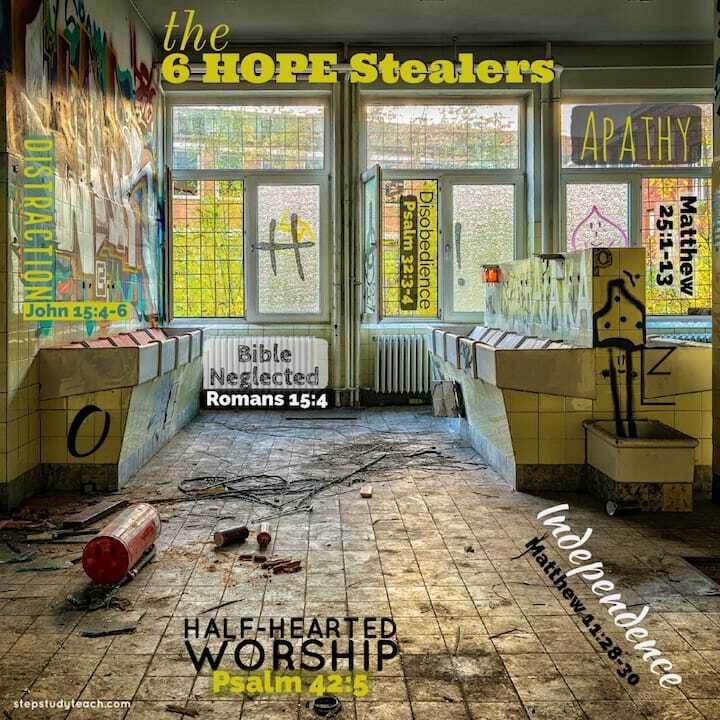 What are the hope stealers in your life? The following list of six hope stealers are guaranteed to sap life from you. Connect the hope stealer to the Scripture. John 15:4-6 - "Remain in me, and I will remain in you. No branch can bear fruit by itself; it must remain in the vine. Neither can you bear fruit unless you remain in me. I am the vine; you are the branches. If a man remains in me and I in him, he will bear much fruit; apart from me you can do nothing. If anyone does not remain in me, he is like a branch that is thrown away and withers; such branches are picked up, thrown into the fire and burned." Matthew 25:1-13 - “At that time the kingdom of heaven will be like ten virgins who took their lamps and went out to meet the bridegroom. Five of them were foolish and five were wise. The foolish ones took their lamps but did not take any oil with them. The wise, however, took oil in jars along with their lamps. The bridegroom was a long time in coming, and they all became drowsy and fell asleep. “Therefore keep watch, because you do not know the day or the hour." Romans 15:4 - "For everything that was written in the past was written to teach us, so that through endurance and the encouragement of the Scriptures we might have hope." Psalm 42:5 - "Why are you downcast, O my soul? Why so disturbed within me? Put your hope in God, for I will yet praise him, my Savior and my God." ​Psalm 32:3-4 - "When I kept silent, my bones wasted away through my groaning all day long. For day and night your hand was heavy upon me; my strength was sapped as in the heat of summer."